True, it’s not Friday, but we’re talking fashion anyway. Friday was a punk rock birthday party for my two year old with about 20 guests. So there has been no attempt at blogging since then. More to come on that later. Anyone who knows me knows that I rarely wear jeans. In fact, I’m almost always in a dress or at least a tunic top. I can’t tell you how often I hear people say something like “Oh Katie, you always look so put together! I could never do that!” While I do appreciate the complements, I have to beg to differ. I am your average busy mom. I have a very active toddler. My husband works pretty much round the clock. I run my own photography business on the side. I’m very active in my church and small group. Regular play dates are a must for me. And because my whole family has food allergies, I do a LOT of cooking. And if I’m not busy with any of the aforementioned things, I’m trying really hard to be active and keep close track of what I’m eating and how I’m progressing toward my health and wellness goals. Ladies, if I can do it, so can you! I have really grown to love wearing dresses. Even as a plus sized girl, even at my very heaviest weight. Why? Because it’s actually easier and way more flattering than anything else. Here’s five reasons why dresses are better than jeans and a tshirt. It’s easy. I don’t have to match much of anything. 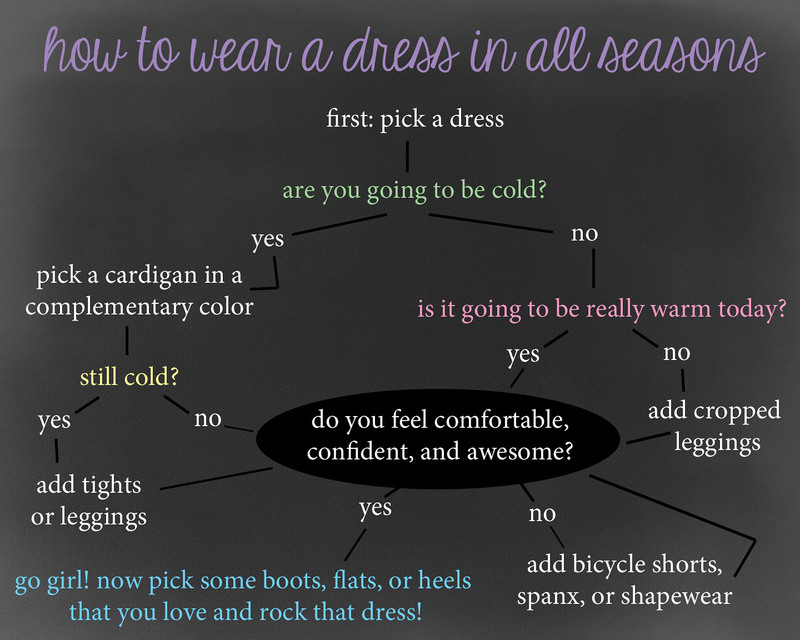 If you open up my closet at any given moment, on my side, you’ll see 5-10 dresses, a few tunic tops, and maybe (when seasonally appropriate) a handful of easily matchable cardigans. Getting dressed, matching, all of it is so much easier this way. I just pick out a dress and put it on. And it works ALL YEAR ROUND! I started to write up an explanation for this and then I thought “I should really make a flow chart.” And then I did!!! It works for absolutely every body type. You just have to find the right cut for you! Experiment with different silhouettes, lengths, necklines, and hemlines. Free flowing, structured, a-line, empire waist, shift? 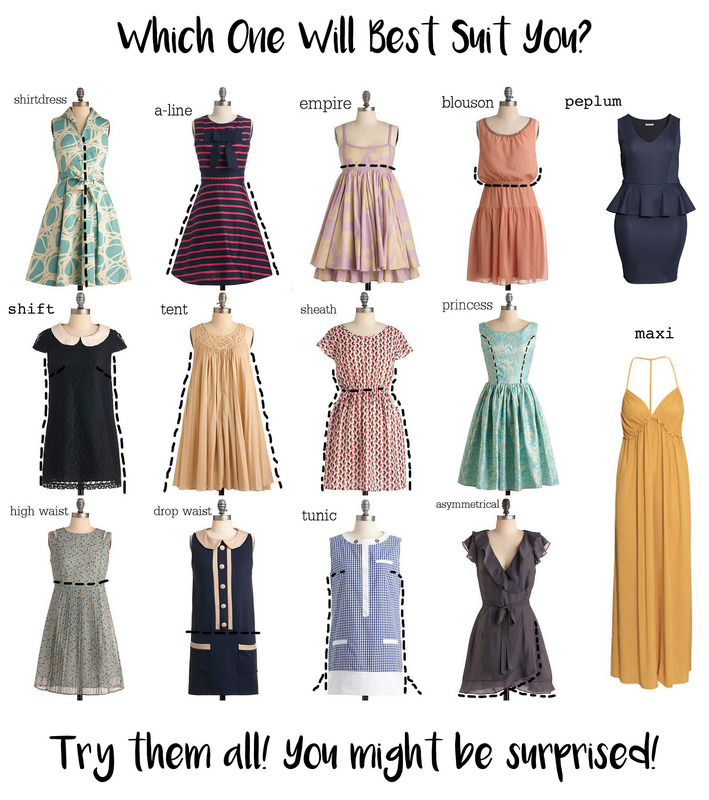 Maxi, tea-length, short, mini? Straight hem, kerchief, asymmetrical, hi-lo? Try them all. You might be surprised! SHAPEWEAR. Ladies, let’s real talk. Remember how Scarlett O’Hara liked to boast about her 17 inch waist? Remember how we also watched Mammy stuff her into that corset? The modern woman’s corset is shapewear. There are lots of different kinds out there that vary in material and purpose. Take a look at the selection next time you’re at Target and figure out which kind sounds most exciting. Are you looking for slimming, smoothing, or support? And for which areas specifically? It may take a little trial and error in the fitting room, but once you find your true match, you’ll never go back! The most important thing is to get THE RIGHT SIZE. Really. Truly. It’s a game changer. Versatility. If my flow chart didn’t help you, maybe this will. This girl committed to wearing the same dress for 100 days to raise money for orphans in India. But it’s unreal how many completely different looks she managed to put together with just one dress and a few other pieces. Watch the video below or click here to visit her website if you prefer photos to videos. Comfort and Confidence. Let’s cut to the chase. I don’t like the way my body looks in jeans. I don’t like the double digit number on the waistband. I don’t like how totally unflattering they are in my middle region. I don’t like how uncomfortable they feel when I sit down. I don’t like how they get noticeably smaller if you put them in the dryer. (Seriously. WHO has time to line dry their clothes?! WHO?!) And yoga/sweatpants paired with a tshirt just make me personally feel kinda shlumpy. (Now, if they make you feel like a rockstar – then YOU ROCK THOSE STRETCHY PANTS, LADY!!) Buuuut on the other hand, if those yoga pants fit more like leggings (or better yet, if they’re Old Navy’s exercise pants with COMPRESSION!) and I wear them with a dress that’s super flattering – I have the best of all possible worlds. Comfort and confidence. Fashion and functionality. Turns out, you actually can have both. I totally agree! Jeans make me feel like I am choking LOL! I think the last time I owned a pair was 1999? !